Cynorkis are terrestrial and lithophytic orchids whose center of distribution is Africa, Madagascar and the surrounding islands. I planted our first Cynorkis --C. fastigiata-- in the Orchid Display House in 2005, and it flowered soon after. When a seedling germinated nearby a year later, I was pretty excited. And then another germinated. And another. We now have C. fastigiata appearing spontaneously in unrelated pots in distant greenhouses. I finally had to admit: I'd planted a weed. 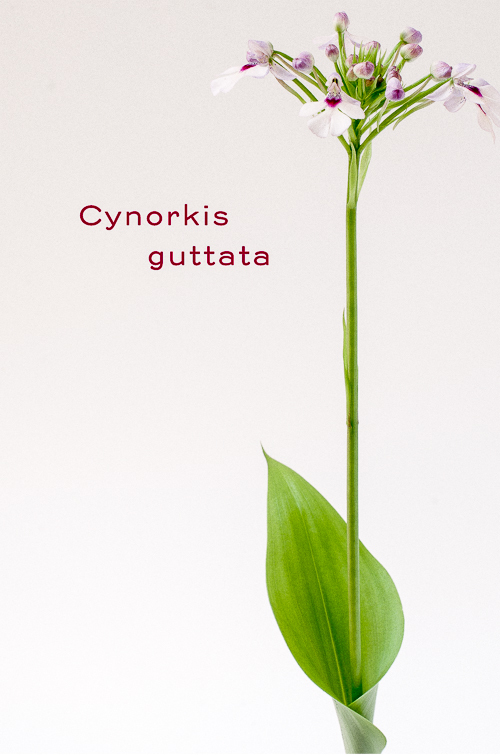 So, naturally, I expected some ridicule from my co-workers when I purchased this guy, Cynorkis guttata. But what a handsome plant. C. guttata is one of 120 or so species of Cynorkis. In their 2007 description in the Orchid Review, Johan Hermans and Phillip Cribb note that it is fairly common (not a huge surprise) in the highlands of Madagascar. And they report seeing plants in degraded habitats on rocky outcrops at 1800 meters elevation. 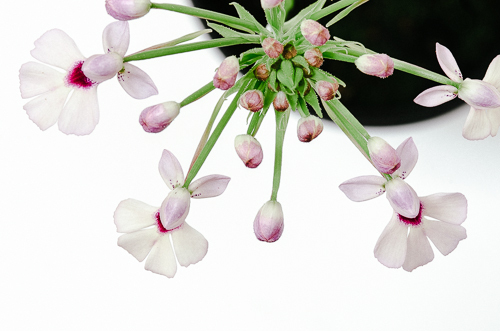 If you have mastered growing Habenaria rhodocheila and H. medusa, this plant will be easy. The underground tubers simply need a dry rest after the foliage withers. 'Dry rest' means less frequent watering, not complete cessation. We let ours become almost bone dry, then we water it. The appearance of the new shoot is our signal to increase the watering frequency.